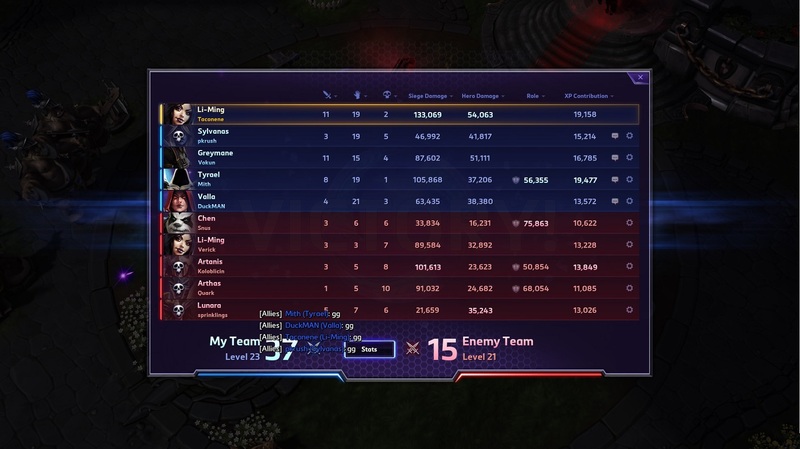 Hello and welcome to my first HOTS guide/build. In this tutorial I will present you with an optimal build for Li-Ming and tell you how to best use that build to be a devastating and feared force on the battleground. With a proper use of this build you should always come out top player DPS and possibly even siege. This build focuses heavily around Magic Missiles as opposed to the two other popular builds out there that focus around Orb and Teleport. Through much gameplay I've found this build to be much more effective at wiping out the enemy team as well as staying alive. This build is designed to maximize your damage output. However, it leaves you very vulnerable and in order to use it properly you need to have really great positioning. This means know when to pull out, don't chase, and don't extend out past your tank. Since the build utilizes Glass Cannon and none of the teleport talents you'll be extremely squishy. Mana regeneration is increased by 100% while below half mana. This talent will give you great sustain, especially in late game where you not leaving the battlefield is important. With this talent you should almost never have to leave to recover MP. If you have a good healer you should almost never have to return to base at all. It's also important because of Li-Ming's trait "Critical Mass" . This Trait resets all of your abilities when you take down an enemy hero or are part of a enemy hero takedown. Late game you may find yourself casting ALOT of abilities and using ALOT of mana. This will help you stay in the fight longer or help with a serious push after you eliminate the other team. When Arcane Orb damages enemies, they are pulled toward it's center. This talent is probably the second most important aside from Astral Presence. Mid to late game this will allow you to set up kill shots on a lot of heroes in the game. You do this by using the orb to pull them back into a certain location and shooting your missiles at that exact spot. This talent stacked with Ess of Johan becomes very potent because if used properly you're almost always guaranteed to land 3 or more missiles. After picking up this talent, the timing of your Magic Missiles becomes very important. You should be casting Magic Missiles almost immediately after you cast Arcane Orb and you must make sure that you cast it in the same spot. Using this ult immediately after using Arcane Orb and Magic Missiles will certainly land you a kill on any of the heroes in the game except for the beefy tanks. Channeling this after your orb and missiles into a group of people works extremely well too.